Church volunteers are the labor engine of a church and without them most churches would not be able to support the services they provide. Volunteers donate thousands of hours each year to sustain the functions of the church and need to be managed well to ensure continued loyalty. Volunteer oversight requires flexibility, patience and creativity in planning and scheduling. Managing church volunteers can be challenging because they are volunteers – free labor! Unfortunately, there is an occasional need to fire a church volunteer and ministry leaders need help in making the painful decision and having the difficult conversation with the volunteer. The need to let a volunteer go could be because of any number of things – a volunteer may have crossed a moral line or maybe they demonstrated behaviors that didn’t represent the church appropriately. Or maybe there are some things going on in their personal lives that affect their performance as a volunteer. 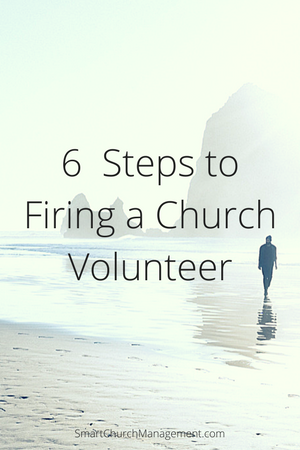 Regardless, the need to fire a church volunteer can be a very difficult situation to manage. Regardless of the reason for letting the volunteer go, it is important to make sure the decision is made based on accurate and objective facts. It is important that the information that led to the decision comes from credible sources that can be verified. Take the time to gather all the information before any conversations with the volunteer. Make sure you give the volunteer the benefit of the doubt and let them share their side of the story. This should be an informal conversation but the goal should be to verify any information that you have collected. A lot can be learned from simply asking the question. But try to remember that this person is on a spiritual journey – like the rest of us. Documenting every step of the way helps keep facts in order and serves as a tool to retain information and remember specific details should there ever be a need to recollect the situation. Whether it is something that another employee or volunteer reported or something that was revealed in a pastoral conversation, document the information with date, time and accurate and objective details. “Where there is no counsel, the people fall; but in the multitude of counselors there is safety”. Proverbs 11:14. Gather a few of the right people around a table and discuss not only the incident that contributed to the decision but also to brainstorm the best approach to communicating with the volunteer and the specifics of how the “conversation” will take place. How the conversation is handled can have a lasting impact on the volunteer so use diplomacy and confidentiality as a guide. Regardless of the reason for asking a volunteer to step down, there should always be sensitivity in how the decision is communicated. Whether the volunteer is in rebellion, had a moral failure or simply was the wrong person for the job, the communication should be gentle, forgiving and pastoral. At the end of the day, he/she is still a fellow Christian, a congregant and a volunteer – free labor. Sensitivity in the way things are communicated should greatly reduce or eliminate any lingering issues as a result of asking them to step down. Was this a training issue? Was it a rebellion issue? Was it a process issues? Taking the time to learn about the incident and how it affected the volunteer, their job responsibilities and other aspects of the church can be helpful to improving how volunteers are managed. It seems counter intuitive to imagine the need to “fire” a church volunteer but unfortunately it is occasionally necessary. Church leaders that give volunteers the benefit of the doubt, and works with them as they develop in their role, can at least minimize the frequency of such a difficult situation. Have you ever had to fire a volunteer? Yes I have. In fact, recently. However, your article is very helpful. I know it’s never easy. Thanks for the comment. Thanks for this article Pat. I will share it with friends.